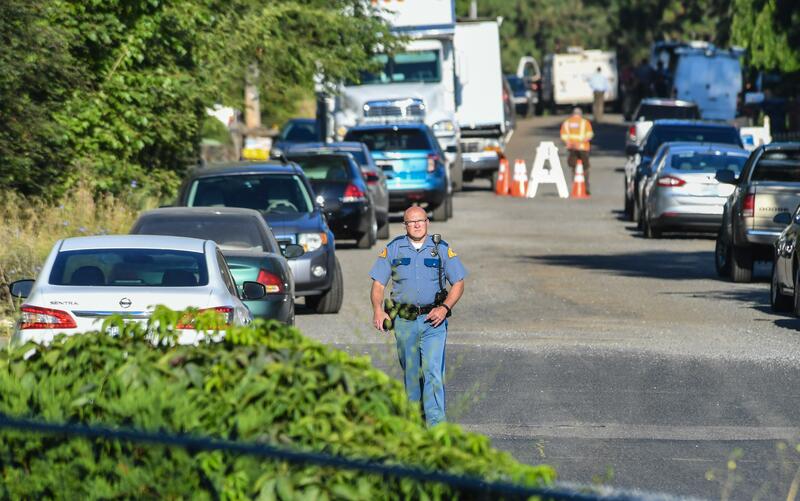 UPDATED: Mon., July 30, 2018, 7:39 p.m.
A passenger in the van of the man shot and killed last week by a Spokane County sheriff’s deputy reported earlier in the evening that she had been kidnapped. The woman later told investigators that the van’s driver, Richard R. Bahr, 54, raped her in a secluded area after kidnapping her, according to court records. She was seated next to him in the van when Bahr was killed by a deputy after a brief chase that ended in the East Central neighborhood on Wednesday. In a search warrant filed Monday in Spokane County Superior Court, police Det. Nicholas Geren wrote that the woman asked a witness at a Conoco gas station at 9213 E. Sprague Ave. for help, saying she’d been kidnapped. The witness said the woman had a swollen face, her arm in a sling, bandages on her chin and wasn’t wearing any shoes. “She provided a telephone number to the complainant and asked her to call it,” Geren wrote. She told deputies that earlier that night she was picked up at Bahr’s daughter’s home in Idaho after recently being released from the Kootenai County Jail, but she was “taken to a campground in Idaho, not to where she had asked,” Geren wrote. The woman said Bahr poured meth into an alcoholic beverage and a coffee cup and asked her to drink. Some time later, Bahr beat and raped her, she told detectives. Then at about 2 a.m., after a witness at Conoco called 911 after briefly talking to the woman in Spokane Valley, Bahr’s 1997 Dodge Caravan was spotted in the area of Hartson Avenue and Thor Street. After leading deputies on a short chase, Bahr turned onto Hill Court, and after reaching a dead end, proceeded to turn around, where his van was struck by a deputy’s vehicle, multiple witnesses said. After giving commands to stop, Bahr was shot by the deputy who has not yet been identified. Bahr was not armed. Officer rendered first aid until paramedics arrives. Bahr was pronounced dead at the scene. The Spokane County Medical Examiner’s Office concluded Bahr died from a penetrating gunshot wound to the face and neck. Shortly after the shooting, Sheriff Ozzie Knezovich told TV news reporters that Bahr, who was not identified at the time, drove toward the deputy who had his gun drawn and was out of his vehicle. Knezovich cautioned during his news briefing that his information was preliminary. Rhonda Dooley, Bahr’s 30-year-old daughter, said her father had a tough life, with multiple encounters with law enforcement. But she was unconvinced that Bahr would purposely speed toward an officer with the intention of hitting them. Dooley said she didn’t blame the deputy, either. Dooley said the woman Bahr is suspected of assaulting was a family friend who needed a ride home after being released from jail. She said it was likely Bahr was under the influence of drugs or alcohol when he decided to run from law enforcement. Bahr had a criminal history in Washington, Idaho and Oregon, including multiple convictions in Spokane County during the 1980s, Dooley and other family members said. And Dooley said Bahr struggled with substance abuse. Still, she said he was an attentive father to her and her sister and an even better grandfather to Dooley’s children. Despite his criminal past and drug use, Dooley described Bahr as a loving man. “Everybody has their faults. Regardless of their faults, he loved his grandchildren. He loved his children. He loved his ex-wife,” she said. Bahr’s criminal record in Spokane included a criminal mischief conviction this summer. He broke into his ex-wife’s home and assaulted his other daughter with a metal bar on May 28. Bahr pleaded guilty to the crime on July 23 – two days before he was shot by the deputy. He had spent 55 days in jail. Published: July 30, 2018, 2:26 p.m. Updated: July 30, 2018, 7:39 p.m.